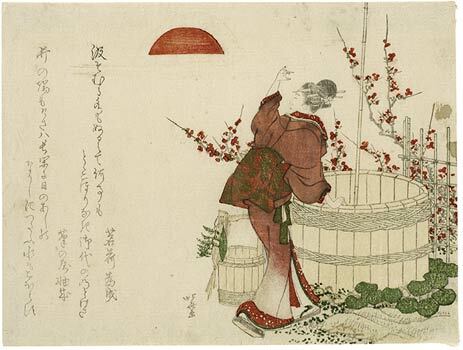 A young woman standing at a wooden well turns to the rising New Year’s sun. The bucket on the left is decorated with fern, straw and a bitter orange leaf for New Year’s. To the left there are two poems about the first water drawn on New Year’s morning being an omen for good fortune. The well in the picture and the poem may indicate that the print was ordered for the Year of the Boar (1803), since “i” can mean both boar and well in Japanese. The calmness of this reign. no drop of water spills.